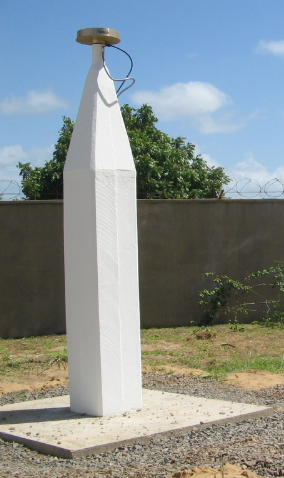 The receiver is situated in the San Marco Telemetry Station, located in Malindi, Kenya. The installation became operational on the 12th November 1995. The original monument hosting the initial station MALI was located in the centre of the station. As the original monument’s sky view became blocked due to additional constructions and tree growth a new monument was constructed at the edge of the telemetry station and the station MAL2 was installed on July 2008. The first receiver was a MiniRogue SNR-8C using its internal frequency standard. in October 1997 the receiver was upgraded to a TurboRogue SNR-12 RM. In April 2001 the receiver was upgraded to an Ashtech Z-XII and an Ashtech chokering antenna was installed. in April 2013 a Leica AR25.R4 antenna was installed. In October 2013 a Septentrio Polarx4 receiver was installed. The communication link has been based originally on a dial-up modem, later on a shared VSAT connection, on ESA permanent lines and currently on a reliable Internet connection from the San Marco station.